It is essential to reduce the wasted machine cycles used for simulation workloads. ‘The 2018 Wilson Research Group ASIC and FPGA Functional Verification Study’ (you may have to register for free to watch this) reports that an ASIC, SoC or FPGA designer can spend up to 40% of the total verification time on creating testbenches, writing tests or running simulation. In addition up to 44% of the time spent on debug – and this involves running simulation too. It is safe to say that simulation is the most dominant technique in the overall verification effort. Simulation speed is losing the race against FPGA complexity. Over the last decade, simulation software has improved at many levels. Simulation software needed these improvements so they would be able to cope with the increasing complexity of designing FPGAs and chips with hundreds of millions gates. Simulation software now supports more languages, assertions, and verification methodologies such as Accellera UVM. Code coverage now includes testbench coverage – in order to keep track of whether a team has exercised specific test stimuli. Interestingly, these efforts have improved the test coverage, provided metrics for signoff and standardized verification approaches based on simulation, but did not accelerate simulation that much. Even the most recent claims from simulation software vendors show RTL simulation acceleration by 4x or maybe 5x thanks to the execution of the simulation on multi-core servers… whereas the complexity of FPGA has been multiplied by 100 in the same period of time! In the study mentioned above, The Wilson Research Group reports that a staggering 84% (!) of the FPGA designs have had at least 1 non-trivial bug escape to production – and that: 65% of the typical simulation times exceed 5 hours. That is why it has become critical to make the most of the time spent in simulation, and limit – as much as it is possible – the wasted machine cycles. Otherwise, our verification techniques are at risk of becoming irrelevant. – Make use of ‘snapshot’ simulation features – which consists in saving the state of a simulation and re-start from there to run specific simulations. In the illustration below, two frequent snapshots are saved – after the boot of the processor and after the DUT is initialized respectively. This conveniently helps running combinations of initialization sequences and test stimuli without having to simulate the boot sequence over and over again. Full system bugs can require multiple days of simulation. What EXOSTIV can do to BOOST simulation. 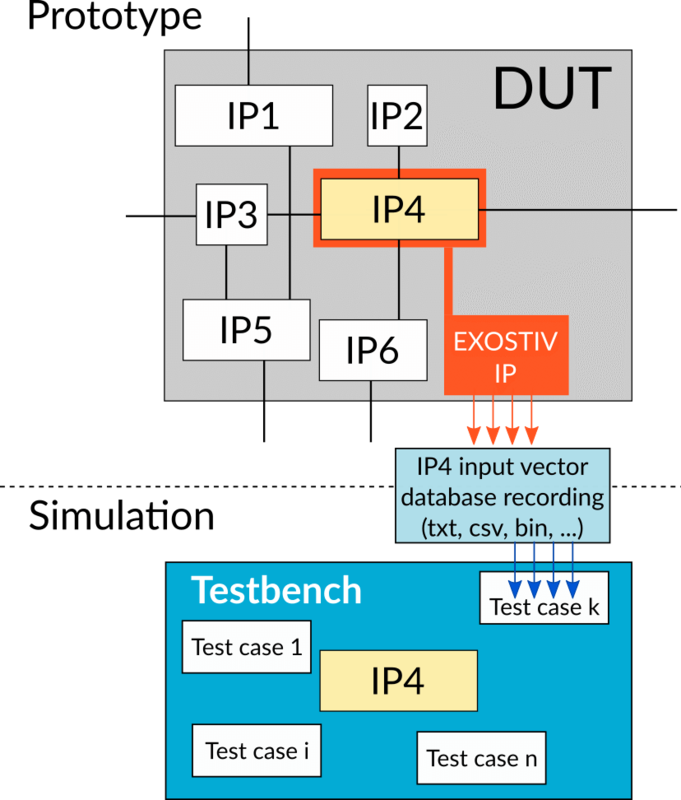 Exostiv lets you record very long data sets from inside FPGAs running at full speed of operation. - Make test case match reality. (such as CDC or metastability). - Functional verification and debug. Exostiv complements simulation by providing a source of real-world stimulus for IPs, groups of IPs and full systems. It therefore helps overcome modelling problems that are the most common source of FPGA bugs escaping to production. Coupling simulation with the huge recording capability of Exostiv means you avoid wasting your quota of machine cycles dedicated to simulation and improves the quality of FPGA system sign-off. When 84% of the FPGA designs report at least 1 non-trivial bug escaping to production, and 65% of the typical simulation times exceed 5 hours (source: The 2018 Wilson Research Group ASIC and FPGA functional verification study), boosting simulation is an absolute necessity. Does FPGA use define verification and debug? You may be aware that we have run a first survey on FPGA design, debug and verification during the last month. (By the way, many thanks to our respondents – we’ll announce the Amazon Gift Card winner in September). – Do you use FPGA as a prototyping technology for an ASIC or a SoC… ? 49 respondents were found in the first group (which we’ll also call the ‘pure FPGA’ users) and 34 in the second group. The survey was posted during about one month online and advertised on social networks. The questions were in English. Behind this segmentation question is of course the idea that the design flow used to design FPGA is usually significantly different (and shorter) than this used to design an ASIC. (This is claimed by FPGA vendors as one of the significant differences between ASIC and FPGA – you can see an example of this comparison here). The chart below illustrates the percentage of respondents in each group who selected each proposed tool or methodology. They had been invited to select all choices that applied to them (click on the picture to enlarge). Without significant difference between the 2 groups, simulation is the clear winner methodology, with a little more than 90% use. Frankly, we wonder how it is still possible not to simulate a FPGA design today – we have not analyzed the cases when designers are able to skip this step. – embedded logic analyzers -such as Xilinx Chipscope, Altera Signal Tap and the likes. Manual RTL code review closes the podium. We expect that any designer actually reviews his/her code. Why is it not 100%? Probably because the ones verifying and debugging FPGA are not the RTL coders. Another possibility is that ‘reviewing the code’ might not be seen by many as a ‘verification technique’, but as the result of the process of verification and debug. While this technique has been around for quite some time now (and is actually complementary to simulation), it is interesting to see that code coverage has got the same popularity in our 2 groups (we do not think that the difference between the groups is significant here). It has been widely said that ‘pure FPGA designers’ are careless and do not use the same advanced and rigorous techniques of ASIC designers. Well, apparently, they do not just care about simulating some cases; they have the same level of concern for properly covering the code as ASIC designers. UVM is quite a hot topic today, with most of the major EDA companies actively promoting this methodology. For those unfamiliar with the subject, here is brief overview. It seems to currently have a quite positive upwards trend for ASIC and SoC design. Tools and environments are appearing on the market, that can be applied to FPGA design too. Like we see on the chart, UVM has not really gained traction among our ‘pure FPGA’ respondents, although near to one engineer on 5 among our ‘ASIC engineers’ has adopted this technique. 1) In-lab testing is a well-entrenched habit of the FPGA designer. And there seems to be no notable difference between our groups. Like we pointed out in a previous publication, in-lab FPGA test and debug is here to stay. We simply believe that – for FPGA at least – this technique must and can be improved. 2) The FPGA engineer seems to be using a mix of methodologies when it comes to debug and verification, but not necessarily a lot of them. Among our respondents, we have found that the average set of techniques used for debug and verification counts 2.58 different techniques (2.39 for the ‘pure FPGA players’ against 2.68 for the ASIC designers). And – please note: simulation is there of course, often completed with code coverage. … which seem to have a very limited adoption among the ‘pure FPGA players’. In a later post, we’ll further analyze the results of our survey. We have shown which techniques are currently used for debug and verification. Of course, the million dollar question is whether FPGA engineers are satisfied with this situation or if they are in need of improvements… Stay tuned.